Who's excited about the total solar eclipse next Monday? We sure are! It has been almost 100 years since the last total solar eclipse crossed the US from the Pacific to Atlantic oceans and 38 years since we last saw a total solar eclipse in the US. Our library will not be hosting a viewing event or distributing solar glasses. If you would like to attend a viewing event at a local library, a map of participating libraries can be found here. Thanks to StarNet for Libraries for being such a great resource to all public libraries during this exciting time! 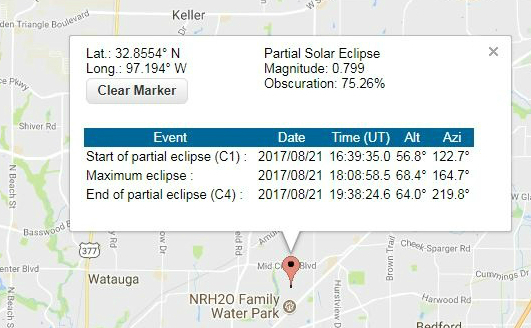 Supplies for solar viewing glasses may be limited at these events, so we suggest sourcing your own from the list of reputable vendors below. We've gathered some resources below for you so that you can be informed about what the total solar eclipse is and how you can view it safely from North Richland Hills. Remember, because we are not in the path of totality, if you wish to view the solar eclipse, you should wear solar protection shades or use another safety method mentioned in the information above at all times. No matter what recommended technique you use, do not stare continuously at the sun. Take breaks and give your eyes a rest! Do not use sunglasses: they don’t offer your eyes sufficient protection. Want to host a Solar Eclipse Viewing Party? Here are some ideas for you! Whether you are hosting a huge party or just viewing the eclipse by yourself, we hope you remember the most important thing: Have fun! Did you catch our staff live on Facebook? If you didn't, you can always watch the replay video of the broadcast here. Thanks to all of those who watched on either Facebook or Instagram. This month our theme was true crime. Check out the list below to see what we were recommending and make sure to like us on Facebook so that you can see our broadcast next month! If you're participating in our Online Reading Challenge make sure to enter the activity code: TRUECRIME to get one step closer to winning prizes! Which one of these true crime books intrigues you the most? Let us know in the comments below! This month our theme was books made into movies! Check out the list below to see what we were recommending and make sure to like us on Facebook so that you can see our broadcast next month! If you're participating in our Online Reading Challenge make sure to enter the activity code: BOOKSTOMOVIES to get one step closer to winning prizes! Which movie version of these books is your favorite? Let us know in the comments below!